Electric storage hot water heaters can have one or two immersion elements (internal heating elements). Dual element hot water heaters are referred to as Twin Element Heaters. Single element storage hot water heaters can either work on M or J Tariff. The difference being that M tariff will ensure that the element is connected to a continual electrical connection, ensuring that it will continually heat the water throughout the day and night as required. J Tariff is a more cost effective way of using electricity to heater the stored hot water and makes the most of cheaper off peak electricity rates throughout the evening. The disadvantage with J Tariffs is that the stored hot water only heats up for a certain amount of hours through the night. Once the stored water is used or displaced throughout the day, it will not reheat until that night. A twin element hot water heater acts as a boost, to provide additional hot water if required. The bottom element on a twin element hot water heater is generally connected to J Tariff (the cheaper off peak tariff) and the second element generally located toward the top of the tank, is connected to M tariff, acting as a boost (if required) which will heat up a small amount of stored water toward the top of the tank. Storage hot water heaters typically stored water at above 70deg Celsius to prevent legionnaires disease from forming. Tempering valves at the heater (where fitted) ensure that a reduced water temperature is delivered to the home for residential applications to prevent scalding, generally in the temperature range of 40-60deg. Storage hot water heaters can have 5, 7 and 10 year tank warranties pending manufactures and models. As a buyer, you may wish to purchase additional warranties to suit your requirements. The tanks are either made from mild/stainless steel are are coated/lined with various materials. Where the cold water supply to the storage hot water heater has a high content of dissolved minerals such as limestone, heating the water causes the minerals to precipitate in the tank. Storage hot water heaters can develop leaks due to corrosion after only a few years. Dissolved oxygen in the water can also accelerate corrosion of the tank and its fittings. Sacrificial Anodes – What are they? 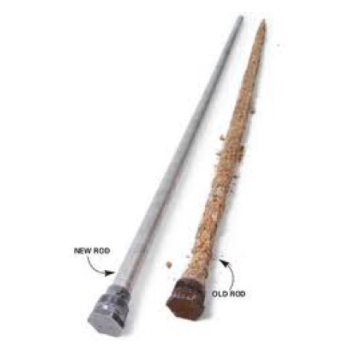 Sacrificial Anodes are a magnesium rod installed inside your hot water tank (storage units only). Its purpose is to protect your tanks cylinder from severe corrosion which can result in premature tank failure. The Sacrificial Anodes are designed to sacrifice themselves to corrosion prior to the tank corroding therefore prolonging the life of the heater. This in turn means that Anodes have a life expectancy of around three years (pending water hardness and quality) and may require replacement during service intervals. Once the Anode has scarified itself entirely your hot water tank will begin to corrode. Regular checking and replacement of you hot water heaters Anodes will dramatically extend the life of your hot water heater and prevent costly premature hot water heater replacements.